Looking for the best hair salon software? Running your very own hair salon has always been your dream, but nobody mentioned the everyday chores that came with it, did they? Managing bookings and staff, collecting statistics and launching marketing campaigns are just some of the tasks you will be faced with. However, with the right hair salon software, you can easily automate the most time-consuming and mundane tasks. Versum will help you to efficiently deal with all the day-to-day hassle, letting you enjoy your work and grow your salon. Automatic appointment reminders, instant online booking, customer review requests and marketing automation are just a few features available in Versum. 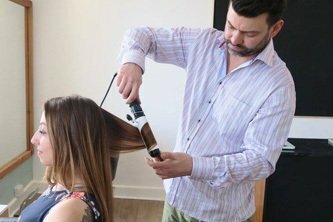 Intuitive hair salon software will streamline all of your everyday tasks, allowing you to get your work done faster and giving you more time for your salon customers – and yourself. Knowing your clients and their preferences is the key to perfect customer service. With help of Versum’s electronic database, you will have insight into every client’s information. Easily check each of their favourite services and products, previous hair colour formulas, photos, notes and any other piece of information you may need to in order to serve them quicker and more effectively. Easily track your product sales, deliveries and stocktakes. The easy to use Versum hair salon program can even predict future backbar usage and let you know if you’re running low on products so you can reorder them in time. Real-time, automated reports provide you with useful insights into stock changes and generated revenue, allowing you to easily stay in control of your business. With just a click of a button, you can generate and view the most important data about your salon and thanks to the app (available soon) you can check it from wherever you are. For additional convenience, generate and print reports whenever you need them, directly from the system. With Versum, everything you need to manage and track stock is just a click away! Versum has far more capabilities than a simple booking system. It is a complete hair salon management solution that will give you all the relevant information on your employees: the number of appointments, product sales, generated revenue, work time and rosters, commissions and even customer retention. Advanced online security features like customer data protection mode, employee access restriction, an activity log and others ensure the safety of your data. With such options, you may even consider going on vacation and leaving your salon in the hands of your team – with Versum, you can see everything that is going on at your salon with the online remote access feature. Very user friendly, easily adaptable as the salon grows and evolves. Stylists and practitioners who have never used salon appointment software find Versum non-threatening and a relief to work with. The most rewarding benefit I personally gain is time to concentrate on other areas within the salon, knowing Versum has everything. Although the paper appointment book brings back acute nostalgia for many business owners, it is an outdated and cumbersome tool. Take control of managerial duties, such as managing bookings, client records, stock levels and staff with an intuitive and dependable online hair salon system. Reduce no-shows with automatic SMS and email appointment reminders, or activate your marketing automation feature to run your campaigns automatically for you. Manage everyday responsibilities with ease, while saving a significant amount of time. Surely you’ll know how to make the most of it! Book a guided tour and see all the benefits of Versum, hair salon software.